Folks, we have a major (albeit fictional) socioeconomic crisis on our hands. For too long the matter has been ignored by authorities for years. I'm not talking about anything that actually hits newspapers—I'm talking about the severe housing crisis in Japan in which teenaged males have been victimized by the sudden arrival on various females of differing persuasions and their forced occupancy into that male's animated residence. Long ago, it had happened to one Tenchi Masaki when aliens moved into his residence, but in the past two years the situation has escalated. Cat-eared aliens (Asobi ni Ikuyo! ), spade-tailed aliens (To Love-Ru), superpowered beings (Sora no Otoshimono, Sekirei), samurai warriors (Hyakka Ryôran Samurai Girls)...even the recent gathering of dream demons (Yumekui Merry), necromancers, magical girls, and vampire ninja (Kore wa Zombie desu ka?) have made living with goddesses seem perfectly sane. 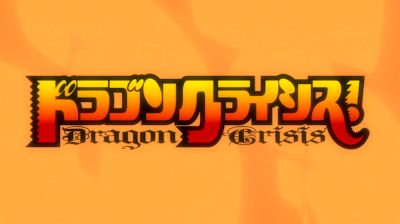 Now, citizens of the celluloid have another invasion to worry about in the show Dragon Crisis!, the latest story to come from the gifted mind of novelist Kaya Kisaki (D.Gray-man, Nagisa Fortissimo). 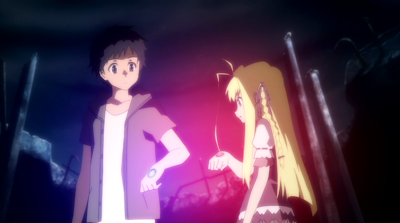 While the series is animated by Studio DEEN under the watchful eye of veteran character designer Masashi Ishihama (R.O.D. -The TV-, SPEED GRAPHER, Welcome to the NHK! ), the show's direction is by Hideki Tachibana, a relative newcomer as a director (H2O: Footprints in the Sand). The overall idea of Dragon Crisis! is linked to the existence of items called "Lost Precious", a general term for relics with spiritual, if not magical, value associated to them. While high-school student Ryûji Kisaragi is not particularly interested in them, his second cousin Eriko is absolutely enthralled by them, even to the point of challenging a mysterious organization known as "Fang" for them. During a particular two-man raid against Fang, Eriko and Ryûji manage to seize a large suitcase from them, only to find that their cargo is a mute blonde girl confirmed to be the human personification of a red dragon. While "Rose" (named after the crimson scales embossed in a flowery design in her hand) is rather fond of Ryûji, he himself is unsure of what sudden dangers Eriko may have brought to his home. Rose is suddenly a major interest to many outside forces—aside from "Fang", a society of researchers studying the myths of dragons want to learn more about her existence and operations in the name of science. However, as any good Dungeons & Dragons fan would tell you, there are many different flavors of dragons out there. One particular black dragon male named Onyx is determined to rescue her from the authorities and wed her in matrimony, but already the imprinting on Ryûji is too much for Rose. Ryûji, already knowledgeable about the power of the "Lost Precious" relics, uses a particular knife given to him by his parents, "Lost Precious" hunters in their own right, to challenge Onyx in an early series showdown. There's no denying that there is star power in the voices. We get variety from Hiro Shimono as Ryûji—while he typically works as the "everyman" lead (Jin, Kannagi; Keima, The World God Only Knows), he actually provides a pretty good voice for a brittle character. 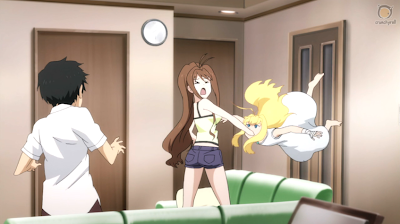 We also finally get the bubbly Rie Kugimiya (Taiga, Toradora!) to play someone other than a tsundere character, but it's the brilliantly cold Hiroshi Kamiya (Izaya, Durarara!!) who reprises his icy voice talents as Onyx. Seriously, guys—throw Kamiya more villain roles. While the vocal and audio tracks are good, the story itself is the certain aspect that has to be the pilot in Dragon Crisis!, as there's nothing really all that special about the artwork. The colors are bright for such a repressed show; there is too much attention to the sky-blue color of Rose's eyes, and even the darker colors from Onyx's powers are softened with violet tones. You do get the occasional blast of light from the "Lost Precious" items in action, but for the most part, there's nothing all that special to the animation. At first, I had guiltily wanted to enjoy the story that Dragon Crisis! had presented to the audience. 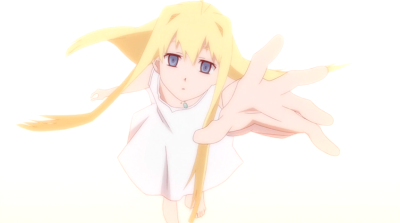 (I mean, Dragon Half was the last time a dragon girl had gotten a lead in an anime, and I certainly loved that show!) It is perhaps the overdramatic vibe of the show that ultimately reins in the creative juices of the show and make it a run-of-the-mill performance. 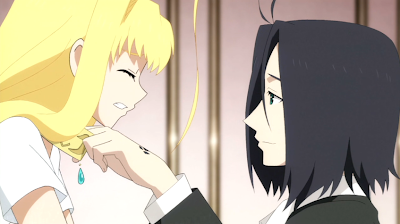 It is definitely refreshing to hear familiar voices in new roles, but it's that inevitable imbalance of character distribution that sours the symphony; ultimately, this is just going to become another story about uninvited house guests and harems, even if there's real chemistry between Ryûji and Rose. I suppose I had some hope that Dragon Crisis! would be better than it was advertised on paper. A major clash between good and evil only three episodes into the show would normally be a welcome change, but the standoff between Ryûji and Onyx only turned into a battle of Leiji Matsumoto laser cannons with both sides retreating to their corners. Considering that Episode 4 is promising us an obligatory beach scene, we're bound to get more corners added to the love polygon surrounding Ryûji, even with the relationship already cemented in place. 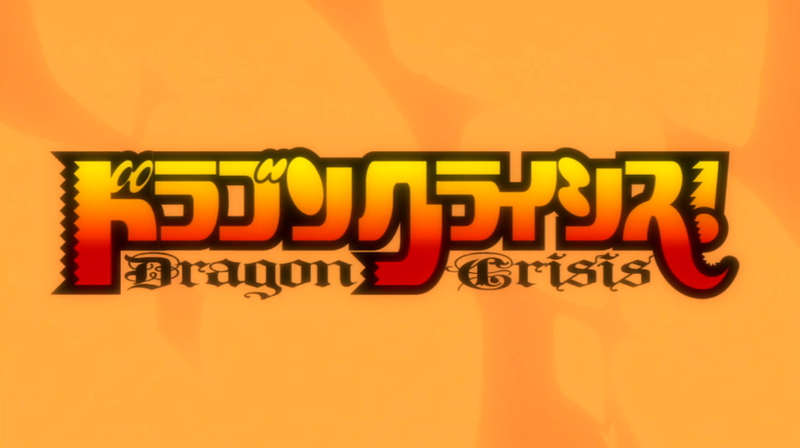 Promising at first but limp in the end, Dragon Crisis! is going to need a little more fire in its belly.